A.J. 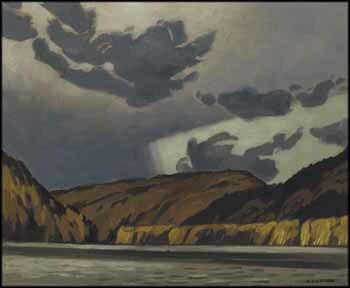 Casson had a great affinity for skies in his paintings, which was well known to his fellow Group of Seven members. Casson stated that they would "even call a certain kind of day - blowing clouds - a Casson day." He loved stormy, electric skies such as this, which he was sure to find during his autumn sketching trips. This depiction of Greenan Lake, near Barry's Bay in the Madawaska Valley, features Casson's dramatic use of geometry in the sky, a style derived from Cubism. A strong right angle of pale grey-green cuts into the steely dark clouds, backlighting the scene. Unusually shaped clouds float underneath the layer of overcast, their angular dark shapes lending more suspense to this brooding sky. Offsetting the sky and steely lake is the palette of warm autumn gold and orange sweeping across the hills. Casson's heartfelt depictions of Ontario were his legacy in the Group, and Evening, Greenan Lake, which crystallizes a moment of primordial beauty, is a fine example of his depictions of that province's wild countryside.